Having already read or at least dipped into my books for this week, it is easily to slip them into two groups: the Good and the Bad. The Secrets of Sir Richard Kenworthy by Julia Quinn – utterly forgettable. 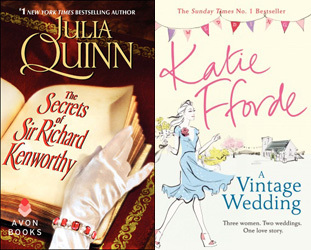 Quinn has always been a bit hit or miss for me but most of her recent books have been misses. A Vintage Wedding by Katie Fforde – awful. One of Fforde’s laziest efforts by far, with atrociously dull dialogue, an uninteresting plot, and so many jarringly unrealistic moments that I spent half the book caught up puzzling over them: 20-somethings who find it difficult to text in moving cars? An architect in his late twenties who has not only bought and is renovating a Georgian house in the Cotswolds but apparently never has to work anywhere but at home? Shock and applause from her friends every time it seems like a woman might be about to form an opinion on an entirely insignificant issue or topic? (frequently accompanied by the phrase “you have obviously thought a lot about this” even before the person explains their thoughts – after they are expressed you can only worry that it took her this long to come up with something so obvious). I will say one good thing: if it really is as easy to start a small business in Britain as Fforde makes it sound (the central characters start a sloppily-run and doomed to be unprofitable wedding business and one of them goes a step further, starting her own B&B), then the government is clearly doing a magnificent job. I’ve picked up Sushi for Beginners but never actually read it. Enjoy! Thanks. The great thing about rereading is that I know I will enjoy it! Unfortunately, I think publishers have a lot to answer for (re, for example, Katie Fforde’s book you mention here.) They want a book a year out of their A-list authors, their readers want a new book (at least) per year, and this is where quality can suffer. I agree that publishers and readers put pressure on authors to produce at a rate most of them cannot sustain but, honestly, the responsibility ultimately lies with the author who sends the work out into the world with his/her name on it. Plenty of authors have learned how to say no and to write at a more reasonable pace. More should learn. I was just going to ask what has happened to Katie Fforde? I loved her earlier books but stopped reading her. I just finished the new Maisie Dobbs. I’m reading Ravensbruck by Sarah Helm, My Struggle, Vol.2 by Karl Ove Knausgaard and The Unlikely Pilgrimage of Harold Fry by Rachel Joyce. I’m enjoying the last two and finding the first extremely informative and well written. Excellent researcher. Ravensbruck sounds fascinating. I remember reading about the camp in The Hiding Place but that’s about the limit of my knowledge. I remember being so happy to have found Katie Fforde — before they invented chicklit. Unfortunately, she’s one of several authors who started off promisingly (Jane Green is another) and became more and more unreadable. So disappointing! I really love some of Fforde’s books, but my fondness for the ones I like is now almost outweighed by my distaste for the ones I hate. Not a pleasant evolution! Yes, I gave up on Katie Fforde quite a few books ago; it was such an “Oh thank goodness, a man has come to my rescue” kind of book. Peyton Place, by Grace Metallious – truly a guilty pleasure tour de force. Yes, she does like those heroic (and yet entirely bland and never sketched out into remotely interesting) male characters, doesn’t she? It’s a bit hard to take. Katie (whom I have met and whom I live very much) used to be a very good writer indeed and has helped many aspiring writers through to publication, but again I stress the pressure of publishers is much to blame; also perhaps they want more chick-lit rather than the kinds of books that Katie started out writing, which were not (in my opinion) chick-lit. I can distinctly recall reading her first novel and absolutely loving it – I can even recall an outing to Shaldon on the River Teign in the month it was published, taking the book along with a flask of coffee and crab sandwiches, and devouring both lunch, coffee and book (in a manner of speaking, of course!) But as you say, Claire, the responsibility lies ultimately with the author. Current reading: Jacqueline Winspear’s last-but-one Maisie Dobbs novel, Leaving Everything Most Loved, in preparation for her latest (which has arrived) A Dangerous Place. This is my current fiction reading. PS I meant to say “like” very much in that first sentence! 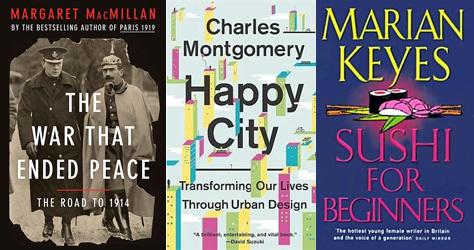 Oooh – the urban design book sounds interesting. 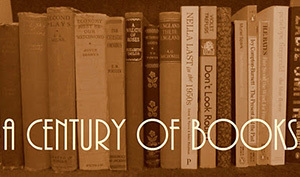 It’s a subject I love, but so many of the books on it are too scholarly for me. How readable was it? Good morning! This is my first time hooking up, hope my post is appropriate to the theme. Found you through Trisha’s site.